Chad Ochocinco wants to keep you informed. Cincinnati Bengals star Chad Ochocinco will follow up his appearance this season on "Dancing with the Stars" with his own reality dating show on VH1. The NFL player is heading to the network with "The Tournament," the working title for the series that will follow the 32-year-old father of four over the course of ten weeks as he looks for someone to become his leading lady in life. According to VH1, the first episode will follow Chad as he crosses the country meeting women who want to date him. During that episode, he will then narrow the list down to 16, four women from each of the four regions of the country. The women will then compete in a tournament for Ochocinco's love. In fact, Chad recently spoke to Access Hollywood's Shaun Robinson about getting a dating show — unless, of course, he hits things off with his celebrity crush, "Modern Family" beauty Sofia Vergara. "I'm single. I've struggled with the dating life," he told Shaun. "I haven't been able to find the right one, so with the help of a show like [that], as long as it's classy… it has to be classy because there's a way to do a show like this and be classy… and very tasteful and I would like it… unless you can get Sofia Vergara to date me." Chad revealed he still hasn't met the Latina beauty, but he had a message for her, which he delivered to Access Hollywood's cameras. "Girl, Sofia… Call me!" he said. "Feel free at any time. Thank you." His "Dancing" partner Cheryl Burke also pointed out that Chad has a little crush on one of his fellow "Stars" — mom of eight Kate Gosselin. "Kate, she's beautiful to me," he said. Chad's dating show will premiere in July 2010. "Dancing with the Stars" Season 10 premieres on ABC on March 22. Previous celebs who have had dating shows on VH1 have included Flavor Flav and Bret Michaels. Chad's friend and potential teammate, Terrell Owens, also recently had a show on VH1, "The T.O. Show," focusing on his life. Terrell, who played with the Buffalo Bills last season, took meetings with the Bengals this week. 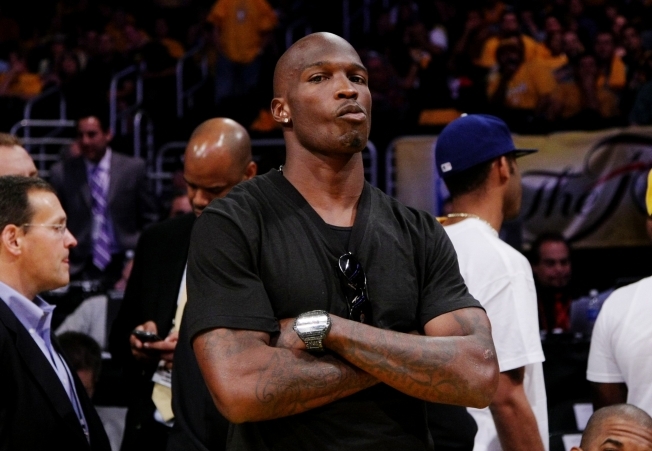 PLAY IT NOW: Who Is Chad Ochocinco's Hollywood Crush?